Ed Stetzer was interviewed this week by Cathy Lynn Grossman for USA Today about Americans’ receptivity to evangelistic contacts and outreach from a church. 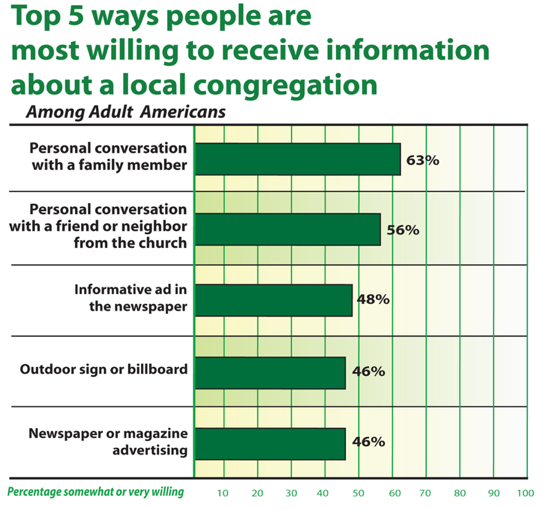 Lifeway Research and the North American Mission Board surveyed over 15,000 people (read more on this report via Lifeway Research) and they found that most people said they would be willing to receive information about church in a personal conversation with a family member, friend or neighbor. This information re-confirms much of the research that I have collected during the 1990s. I’m glad to know that research organizations are still looking into these issues. 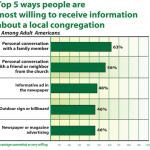 Ultimately the research showed that relationships remain the most effective approach to those outside of the church, and that good marketing / advertising are a good support, but not enough on their own. Considering our series on building relationships and looking at our spheres of personal influence, the data still indicates that if we want our churches to grow, we need to be inviting people to them, as well as talking about our personal faith in Christ.